GleSYS, a next-generation global cloud platform, was experiencing performance issues with its legacy storage system. 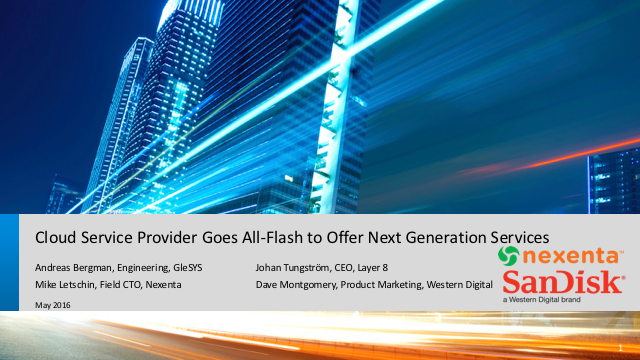 By deploying a software-defined all-flash storage solution from Nexenta and SanDisk®, GleSYS was able to significantly decrease latency while achieving higher IOPS and decreased server footprint. In addition, since the implementation, the GleSYS team has spent a tiny fraction of their time on administration, allowing them to focus on other business and technology issues, such as providing enhanced services to customers. Join members from GleSYS, Nexenta, SanDisk, and Layer 8 to hear the real world testimonial and deep dive into how the NexentaStor and SanDisk® Flash solution delivers the industry’s best value solution for high performance mature unified block and file services, scaling up to four petabyte (PB) configurations.